I was proud to have not only be one of some 100,000 participants, but I signed up as one of the goldenrod-shirted volunteers of the event. I got to stand guard at Hel-Mel (Heliotrope and Melrose) and answer questions and/or guide people if they needed general assistance. Other volunteers sold CicLAvia merchandise (the proceeds of which go towards funding future CicLAvias), some were “Road Angels” who performed emergency repairs, others performed participant counts. I had a video camera and interviewed people there, both people I knew and total strangers of whom I was curious how they heard of the event. Some came as far as Lake Elsinore, others, like me, from up the street. Some had road bikes, mountain bikes, fixies, cruisers, recumbents, custom recumbents, some pulled bike trailers. There were even people walking dogs, running teams, a mother pushing her special needs son around in a wheelchair, a man on a Segway, kids on kick scooters, teens on roller blades, you name it. I plan to put out a mini-documentary video later this week. There was young an old. Connecting. An octogenarian cyclist mingled with teenagers and shared tube repair tips. This was perhaps one of my most memorable scenes – how this event can bring all sorts of people together. People took to the streets in a revolution of sorts; their ammunition were their smiles. This scene finally convinced me that CicLAvia was for real. After my volunteer shift, I took a ride to the other end in Boyle Heights. I ride my bike down Heliotrope and New Hampshire all the time, but it never looked like this. Saw a lot of cute gals. Saw a lot of friends. Both passed me by in a matter of seconds. A few bands played impromptu sidewalk concerts. A street in the Pico-Union area was cordoned off for a dodgeball game. Chalk art decorated the urban canyon of 7th Street in Downtown, which offered a cool, shady respite for this hot, 93-degree day. 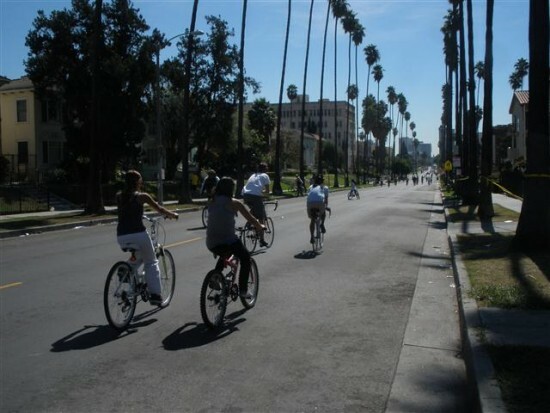 The end of the route came all but too soon, but hopefully many people discovered that an open-streets event like this made this large city smaller, and erased the psychological barriers of concrete, namely the 101 and 110 freeways and the Los Angeles River. When I got back to East Hollywood, I was surprised to see my friend and fellow former East Hollywood Neighborhood Council governing board member Ed Magos, who was involved in a well-publicized hit-and-run bicycle accident in January. Not only was he there, but he was on a bike. He told me this was his first time riding on L.A.’s streets. I was nearly in tears when he told me that, having known what he had been through these past 10 months. CicLAvia took on a deeper meaning in this case. It represented hope, healing, glory. Awaiting us at Hel-Mel after 3 o’clock was half a dozen lowrider cars. We had gotten so accustomed to having no cars on the streets that the noise and exhaust were suddenly bothersome. It was almost as if the cars were waiting to re-claim their turf. 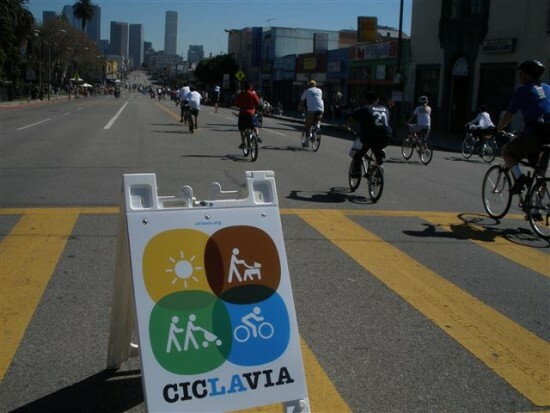 But CicLAvia is not and will never be a one-off event. The success of the event was plainly obvious. Again, kudos and much props to the organizers, who took the proverbial pie from the sky and brought it not only to the table, but into our stomachs. And that pie was delicious. They truly made history on Sunday. Can’t wait until the next one! View this set on Flickr!